David Silverman was the president of the American Atheists organization. Silverman was fired due to allegations of financial conflicts and sexual assault. According to the 2014 General Social Survey (GSS), the number of atheists and agnostics in the United States has remained relatively stable in the past 23 years. In 2014, 3% of Americans identified as atheists, and 5% identified as agnostics. In 1991, 2% of Americans identified as atheist, and 4% identified as agnostic. Post Elevatorgate (a July 2011 controversy in which Richard Dawkins was accused of misogny), there has been a lot of friction with the atheist movement (see: Atheist factions). At the American Atheists 2018 convention, David Silverman, ex-president of the American Atheists organization, gave a speech entitled, "How the mighty get back up". The speech alluded to the pro-religious rights agenda of the Trump administration (See: Donald Trump and American atheists). During the speech Silverman said regarding American atheists, "We are suffering a level of defeatism that I have never seen before". (See: Decline of the atheist movement). Later in 2018, Silverman was fired due to allegations of financial conflicts and sexual assault (see also: Atheism and sexism). Silverman was a new atheist. New Atheism is a form of militant atheism which was launched in 2006. Due to the Elevatorgate controversy and ongoing accusations of prominent new atheists engaging in Islamophobia, the New Atheism movement has waned (see also: Richard Dawkins' loss of influence and Richard Dawkins and Islamophobia accusations). On November 6, 2015, the New Republic published an article entitled, Is the New Atheism dead? Liberal Christianity is shrinking in the United States and some of these individuals are becoming "nones"/religiously unaffialiated (only 7% if nones are atheists), others are embracing more conservative/fervent forms of Christianity and a small percentage are joining the atheists/agnostic camps. Dr. Sam Harris is a founder of the New Atheism movement. Sam Harris is quite aware of the stigma surrounding atheism and has even advocated that atheists no longer call themselves atheists. In fact, Dr. Harris has said concerning the label of atheist, "It's right next to child molester as a designation." Dr. Ken Eisold wrote at Psychology Today about American atheism: "The FT reporter commented: 'As I found out when I travelled across the US last year, atheists live in isolation and secrecy all over the country.'" The 2013 Freedom of Thought report published the International Humanist and Ethical Union indicates: "...the U.S. has long been home to a social and political atmosphere in which atheists and the non-religious are made to feel like lesser Americans or non-Americans." “ 1. Americans equate a lack of religiosity in general – or atheism specifically – with immorality. 2. Americans equate a lack of religiosity in general – or atheism specifically – with being un-American and/or unpatriotic. 3. There is no stigma concerning the expressed dislike of the non-religious. While there is a stigma (to varying degrees, depending on one’s social milieu) attached to being racist, or anti-Semitic, or Islamophobic... – there has never existed a social or cultural backlash against people who openly express disdain for secular folks. So people simply feel much more comfortable expressing their dislike for atheists than, say, Latinas/os or women. An American speaker in the atheist panel discussion "Where do we go from here?" at Reason in the Rock 2013 declared: "We are still culturally and politically marginal. We still don't have very much influence... We are ineffective." Due to Hispanic evangelicals, church attendance was up in New York City in 2013. With the continued rise in the number of Hispanic, Roman Catholics and evangelical Christians in North America and the rise of evangelicalism in Latin America and South America, secular leftism is not going to be dominant in America's long term future. Professor Eric Kaufmann, Birkbeck College, University of London, specializes on how demographics affects religion/irreligion/politics. “ According to a recent a demographic study by University of London Professor Eric Kaufmann, there is a significant demographic deficit between secularists and conservative religionists. For example, in the U.S., while self-identified secular women averaged only 1.5 children per couple in 2002, conservative evangelical women averaged 2 to 3 children per couple, which amounts to a 28 percent fertility advantage. Now Kaufmann notices that this demographic deficit has dramatic effects over time. In a population evenly divided, these numbers indicate that conservative evangelicals would increase from 50 to 62.5 percent of the population in a single generation. In two generations, their number would increase to 73.5 percent, and over the course of 200 years, they would represent 99.4 percent. Kaufmann noticed further that the more religiously conservative, the more children. For example, the Amish double in population every twenty years, and are projected to number over a million in the U.S. and Canada in just a few decades. We're seeing a similar trend among Mormons, who have averaged a 40 percent growth per decade, which means that by the end of the century, there will be as many as 300 million Mormons in the world, or six percent of the world's population. And note: Mormons vote overwhelmingly Republican. Now in stark contrast to all of this, Kaufmann's data projects that secularists consistently exemplify a low fertility rate of around 1.5 percent per couple, which is significantly below the replacement level of 2.1 percent. And so he sees a steady decline of secular populations after 2030 or 2050 to potentially no more than a mere 14 to 15 percent of the American population. He notices that similar projections apply to Europe as well. Kaufmann, who is an agnostic, wrote about the higher fertility rate of the religious right, "Furthermore, the demography of the nation suggests that God may ultimately be on the side of the Religious Right." In 2013, citing experts in demography and survey data, the Christian Post declared that there were three trends pointing to the United States potentially becoming more religious in coming years - namely an aging population becoming more religious over time, religious immigrants and the higher fertility rate of religious conservatives. Due to Hispanic evangelicals, church attendance was up in New York City in 2013. With the continued rise in the number of Hispanic, evangelical Christians in North America and the rise of evangelicalism in Latin America and South America, secular leftism is not going to be dominant in America's future. Current religious demography scholarship suggest that the relatively low fertility of secular Americans and the religiosity of the immigrant inflow provide a countervailing force that will cause the secularization process within the total population to plateau before 2043. This represents an important theoretical point in that demography permits society to become more religious even as individuals tend to become less religious over time. “ We find considerable stability of religious groups over time, but there are some important shifts. Hispanic Catholics experience the strongest growth rates to 2043. Immigration, high fertility, and a young age structure will enable this group to expand from 10 to 18 percent of the American population between 2003 and 2043, despite a net loss of communicants to secularism and Protestantism. This will power the growth of Catholics as a whole, who will surpass Protestants by mid century within the nation’s youngest age groups. This represents a historic moment for a country settled by anti-Catholic Puritans, whose Revolution was motivated in part by a desire to spread dissenting Protestantism and whose populationon the eve of revolution was 98 percent Protestant (Huntington 2004; Kaufmann 2004). Another important development concerns the growth of the Muslim population and decline of the Jews. High Muslim fertility and a young Muslim age structure contrasts with low Jewish childbearing levels and a mature Jewish age structure. Barring an unforeseen shift in the religious composition and size of the immigrant flow, Muslims will surpass Jews in the population by 2023 and in the electorate by 2028. This could have profound effects on the course of American foreign policy. Within the non-Hispanic white population, we expect to see continued Liberal Protestant decline due to low fertility and a net loss in exchanges with other groups. White Catholics will also lose due to a net outflow of converts. Fundamentalist and Moderate Protestant denominations will hold their own within the white population, but will decline overall as the white share of the population falls. The finding that Protestant fundamentalism may decline in relative terms over the medium term contrasts with a prevailing view that envisions the continued growth of “strong religion” (Stark and Iannaccone 1994a). This is the result of an older age structure, which increases loss through mortality, and immigration, which reduces the size of all predominantly white denominations — all of which are poorly represented in the immigration flow. Fundamentalists’ relatively high fertility and net surplus from the religious marketplace is not sufficient to counteract the effects of immigration. Obviously, this could change if significant immigration begins to arrive from more Pentecostalist source countries such as Guatemala or parts of sub-Saharan Africa. Our work also sheds light on the religious restructuring paradigm, though we do not find a clear victor between secularism and fundamentalism. The secular population will grow substantially in the decades ahead because it has a young age structure and more people leave religion than enter it. The sharpest gains for secularism will be within the white population, where seculars will surpass fundamentalists by 2030. On the other hand, there are important demographic limits to secularism, demonstrating the power of religious demography. The relatively low fertility of secular Americans and the religiosity of the immigrant inflow provide a countervailing force that will cause the secularization process within the total population to plateau before 2043. This represents an important theoretical point in that demography permits society to become more religious even as individuals tend to become less religious over time. The Journal of Contemporary Religion says about schisms within atheism: "The persistence of internal schisms and regular outbreaks of in-fighting within the atheist movement also ensure that much energy is effectively wasted on parochial concerns and further undermine attempts to establish a genuine sense of group cohesion." “ The organisational structure of the atheist movement is characterised by plurality and eclecticism. Based around no predominant group and possessing no formal leadership or tangible set of governing arrangements, this movement assumes a non-hierarchical and decentralised form that operates within a number of organisations set up to promote a range of atheist, secularist, and humanist (collectively referred to here as ‘ASH’) ideas and causes. Notable organisations include: the American Humanist Association (established in 1941), American Atheists (formed in 1963), the Freedom From Religion Foundation (1978), the Council for Secular Humanism (1980), the Atheist Alliance of America (1991), the Center for Inquiry (1991), the Military Association of Atheists and Freethinkers (1998), the Secular Student Alliance (2000), the Secular Coalition for America (2002), and the United Coalition of Reason (2009). At the present time, little is known about the specific composition of such groups and the reasons why individuals become actively involved in the atheism movement are still being debated (e.g. LeDrew). Research suggests that a majority of atheists positively engage in efforts to promote atheism in some form (Silver), but it appears that only a small percentage become involved in formal organisations of this kind. Research also indicates that atheists who are actively participating in formal non-religious organisations tend to belong to a number of different groups at any one time (Hunsberger and Altemeyer). According to Republican Atheists' President Lauren Ell, the leading atheist organizations such as American Atheists, Freedom From Religion Foundation and Secular Student Alliance lean left politically. The likelihood that American atheists will engage to 100 years of sustained, intense effort as far as atheist activism is remote (See: Atheism and apathy and Views on atheists). In addition, demographic trends point to the atheist population in the United States plateauing in the 21st century as far its proportion of the American public (see: Demographic trends in American secularism). Furthermore, due to various historical events/trends, the atheist movement saw a number of setbacks during the latter portion of the 20th century and beyond. As a result, it has lost a considerable amount of confidence (See: Atheists and the endurance of religion). A University of Tennessee at Chattanooga study of non-believers found that there are 6 types of atheists/agnostics/non-believers: atheists/agnostics who are more intellectually minded (38% of total sample); non-believer political activists who commonly get involved in leftist/political causes more than atheist activism (23% of non-believers, most atheists lean toward the left end of the political spectrum, see Atheism and politics); Anti-Theist (This vocal group often gets conflated with all atheists by believers, but they merely constitute 15 percent of non-believers); Seeker-Agnostic (makes up 7.6 percent of non-believers) and Non-Theist (apathetic and is only 4.4 percent of non-believers). As noted above, Americans typically have a very negative view of atheists and they are often seen as lacking moral character and very arrogant (see also: Views on atheists and Atheism and morality and Atheist population and immorality and Atheism and arrogance). In 2012, the organization PolitiFact Rhode Island accused American Atheists president David Silverman of wildly exaggerating the number of atheists in America by attempting to included the Unaffiliated (also called Nones) who made up about 15% of the United States population at the time (despite the fact that only 15 percent of "nones" identify as atheists) and by also attempting to lump agnostics with the atheist population. The 2008 American Religious Identification Survey (ARIS) found that only 0.7% of U.S. adults identified as atheist, but at the same time 2.3% said there is no such thing as a god. The reluctance of Americans to self-identify as atheists is likely due to the American public's low opinion of atheists (See: Americans have a low opinion of atheists). The atheist Georgetown professor Jacques Berlinerblau likens the strength of the American atheist movement to a "gimpy little zebra". According to a 2007 Pew Forum survey, about 4% of Americans are atheists/agnostics. A 2008 Gallup poll showed that 6% of the U.S. population believed that no god or universal spirit exists. According to 2013 FBI statistics, 6/10 of a percent of hate crimes were against atheists/agnostics. Dennis Prager is a vocal opponent of atheist indoctrination in public schools. In the United States, a significant amount of atheists are white males and the American atheist population has been criticized for its lack of racial diversity and lower amount of females in its population (Western atheism and race and Atheism and women). The Pew Research Forum reported in 2013 concerning American atheists: "About four-in-ten atheists (43%) have a college degree, compared with 29% of the general public." In 2012, the Pew Research Forum reported regarding American atheists: "And about 38% of atheists and agnostics have an annual family income of at least $75,000, compared with 29% of the general public." Also, atheists within the United States have developed a reputation of uncharitableness as they gave far less to charities, even if church donations are not counted (see: Atheism and uncharitableness). As a result of these factors, claims of being an oppressed minority by atheists are often not taken seriously even by fellow atheists (For more information, please see: Atheist whining and Persecution of atheists). In addition, given the favorable treatment atheist activists often receive in the media and the atheistic indoctrination that occurs in public schools/universities, the notion of atheists as an oppressed minority is often rejected by Americans. At the same time, in America as in many theistic societies, atheists are the least trusted group and many Americans have a low opinion of atheism/atheists (see: Views on atheists and Atheism and social outcasts). Historically, many Christians have shown a significant amount of patience/tolerance towards atheists - even in face of persecution by atheists (see: Christian patience, forgiveness and long-suffering towards atheists). The Reason Rally was billed as the largest secular event in history. It was held in the National Mall in Washington, D.C. on March 24, 2012. According to the Religion News Service 8,000-10,000 people showed up for the rally. The Atlantic reported 20,000 individuals were in attendance. In the United States, the Hispanic population is expected to triple by the year 2050 and become 30% of the United States population. President-elect Donald J. Trump’s victory dealt that movement a body blow when he garnered 81 percent of the white evangelical vote and 60 percent of the white Catholic vote. Mormons, too, voted overwhelmingly for Trump. Despite Trump’s not being a particularly religious person, his platform was seen as anti-secular in many atheist and humanist circles. He said he would appoint religiously conservative Supreme Court justices, ban Muslim immigrants, favor Christianity and repeal the Johnson Amendment, which prohibits certain tax-exempt organizations from endorsing political candidates — issues antithetical to organized atheism and humanism. ↑ American Atheists President David Silverman says there are twice as many atheists in U.S. as Jews, Muslims, Hindus and Buddhists combined By C. Eugene Emery Jr. on Sunday, February 26th, 2012 at 12:01 a.m.
↑ Belief in God Far Lower in Western U.S. Gallup.com. Retrieved on 2012-02-05. ↑ Winston, Kimberly (March 24, 2012). 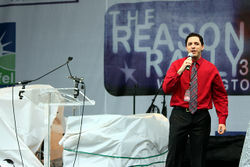 "Atheists Rally On National Mall; The 'Reason Rally' Largest Gathering Of Nonbelievers (PHOTOS)". Huffington Post. Retrieved 2012-05-02. ↑ Benjamin Fearnow & Mickey Woods, "Richard Dawkins Preaches to Nonbelievers at Reason Rally", The Atlantic, March 24, 2012. This page was last modified on 15 April 2019, at 12:39. This page has been accessed 30,840 times.